Tennessee Strips $250,000 From Memphis As Payback For Removing Confederate Statues A Democratic state lawmaker called the amendment "hateful" and "unkind." Republicans defended the move, calling Memphis' removal of the statues "sneaky." A statue of Confederate Gen. Nathan Bedford Forrest seen in August 2017 in Memphis, Tenn. The statue and one of Confederate President Jefferson Davis were removed last year. The city of Memphis could lose a quarter-million dollars as punishment for removing statues of Confederate Gen. Nathan Bedford Forrest and Confederate President Jefferson Davis last year. The Tennessee House of Representatives voted Tuesday to strip the money from next year's state budget. The sum had been earmarked to go toward planning for Memphis' bicentennial celebrations next year. As NPR's Laurel Wamsley reported, the statues were removed last December after the city found a legal loophole. It sold two of its city parks – one with a statue of Confederate President Jefferson Davis, the other featuring a statue of Gen. Nathan Bedford Forrest on horseback — for $1,000 each. The surprise move sparked lively debate among lawmakers and came just before legislators were to give final approval to Gov. Bill Haslam's $37 billion spending plan. It angered several Memphis lawmakers, including Democrat Raumesh Akbari, who blasted the decision on the House floor. "This amendment and the explanation, it is hateful, it is unkind, it is un- Christian-like and it is unfair, OK?" she said. "Memphis is a city in this state, and I am sick of people in this House acting like it is not." State lawmakers have been debating all session how to get back at Memphis for removing the statues last December. 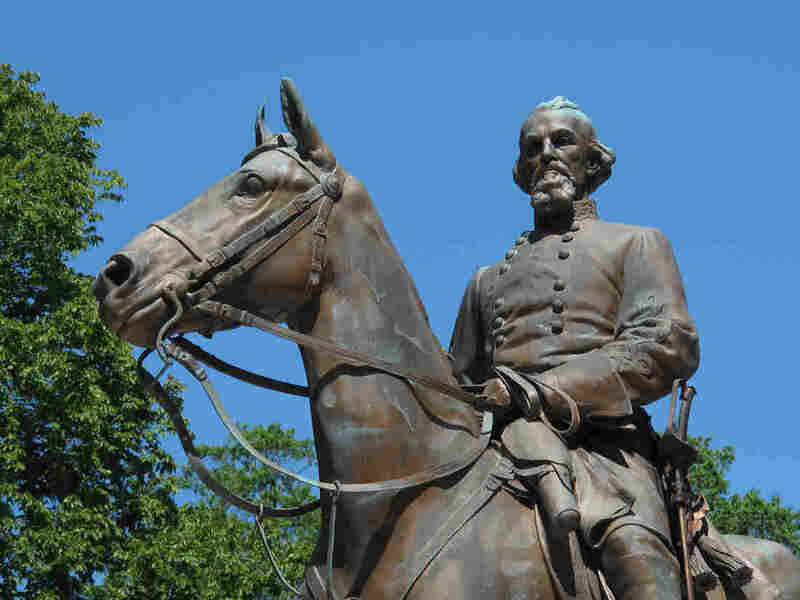 Many were angered that Memphis officials circumvented a state law designed to protect Confederate memorials, by selling the parks the statues were in to a nonprofit. That organization then took down the monuments, which remain in safekeeping while the courts sort out what to do with them. Rep. Gerald McCormick, R-Chattanooga, and other Republicans defended the decision to withhold funding from the bicentennial celebrations, saying there had to be consequences for flouting the will of the state legislature. "I think the city of Memphis, like any other city in the nation, needs to if not obey the law, at least obey the spirit of the law," he said. "The law was very clear, and they got smart lawyers to figure out how to wiggle around the law." Republican Rep. Sabi Kumar of Springfield said revoking the funding was not about Christianity, "This is politics. What was done in Memphis, in removing the monuments, was basically a sneaky thing to do." Democrat Bo Mitchell warned of "bad consequences," not just in Memphis or Tennessee, but nationwide. "Because what you're doing here today is the bad actions of someone who brought arms against their nation and fought against our country, committed treason, then was a proven war criminal, and was slave trader," he said, referring to Forrest. "You're going to choose to honor that person here on this floor today and hold it against a city."